Foursquare has launched a seemingly small update to its iOS app, adding a 1 of 10 score that appears next to the name of a place. This makes it an instant competitor for many of the recommendation surfacing services like Yelp. The data is based on a bunch of data that Foursquare collects, which it says result in more accurate and varied results than the typical ‘other site’, where ratings can all meet in the middle. Foursquare says that it’s not using star ratings assigned arbitrarily by visitors to come up with the number. Instead, it combines a bunch of different data points including tips, likes, dislikes, popularity, loyalty, local expertise, and the almost 3 billion check-ins that it has collected from over 25 million users. I’m just loving the stuff that Foursquare has been doing with its apps and service lately. Opening the explore feature to those who have not even signed up for the service was a fantastic way to leverage the data gathered by their users in a conscientious manner. The utilization of multiple data elements to generate a dynamic rating, rather than just soliciting a star measurement could do a lot to eliminate a capricious or random act of negative feedback and produce a more accurate rating over time. The addition of ratings to its Explore feature is huge, and follows a series of recent updates that have made it more competitive with services like Yelp. Foursquare opened up Explore feature to all visitors of its website recently, regardless of whether they were even a user of the service. It was just a matter of time before it ended up on mobile platforms, but it was a bit surprising that the first to get it was BlackBerry. That feature allows you to hit up the Explore section of Foursquare regardless of whether you’ve ever used it to check in once. This opened up the data contributed by the millions of users to everyone who visits the site or uses the BB app. Clever girl. The new ability to see a rating isn’t the only thing that Foursquare has done to become a competitor to other recommendation services. It has also been adding business hour listings and other small tidbits. But adding a rating is a huge gauntlet thrown. 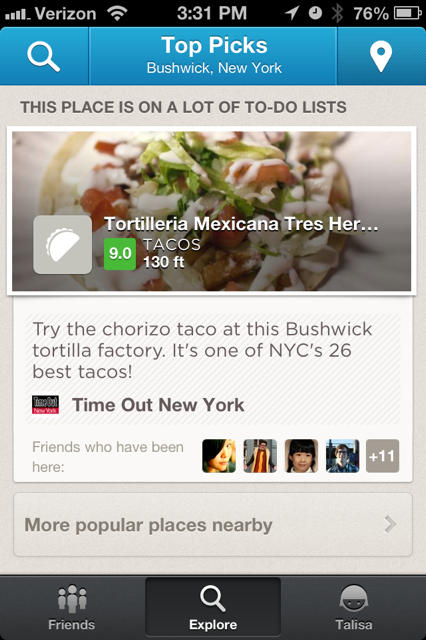 Foursquare recently announced a partnership with Opentable for reservations, which makes even more sense now. It also updated its Android app to bring back the ‘nearby friends’ filter and simplified its Explore view with a better map, new search filters and more.